How, if at all, can we help bring democracy to countries which now live under authoritarian rule? That is a question much discussed in recent years. We have made some progress in understanding what democracy means. At first most people thought it was mainly a matter of free elections. The other day I listened again to the farewell speech of Chris Patten, the last Governor of Hong Kong. With his usual eloquence he described the assets which added up to a civic society in Hong Kong – the charities, the free press, the independent judiciary, the host of voluntary organisations. All that Hong Kong lacked was the ability to choose its Executive in free elections, though Chris Patten helped the colony a good way down that path. By contrast Gaza, which has held free elections, has none of the other components of a civic society. Which is the city more to be envied – the one with free elections or the one without? We know now that free elections are only one of the necessary components of a democracy. One of the most elusive of these components is opposition, by which I mean the existence of organised groups in and outside the legislature who have the double function of criticising the government and seeking to replace it. The concept of opposition is sophisticated. In less sophisticated societies the rulers, even when democratically elected, find it hard to grasp that they should not only tolerate but actually facilitate the irritating opposition groups who can make their lives as rulers extraordinarily difficult. When David Cameron came to help me launch my biography of Peel he quoted from his notes on Peel's Tamworth Manifesto. The Manifesto was addressed in 1834 by Peel as incoming Prime Minister to his own constituents in Staffordshire. It was circulated as the first national manifesto in our political history. Peel's first government lasted only one hundred days, but the Tamworth Manifesto provided the framework for Peel's party in opposition over the next seven years. Peel inherited as leader a party exhausted and demoralised by the election defeat of 1832. The Tories two years later found themselves facing an electorate, a large part of which they had tried to prevent from acquiring the vote. The debates on the Great Reform Bill had taken place against a background of popular agitation and occasional violence which badly shook the morale of the Tory leadership. Many of them, such as the Duke of Wellington, felt that there was no future for people like himself in politics any longer. No one had invented then the idea of a political pendulum gradually swinging against the government of the day. There seemed no reason why the Tories should ever regain power. In order to give the Party a chance of success Peel had to redefine it or, as we would now say, rebrand it. He had to accept the Great Reform Bill and acknowledge that further reforms might be needed; but he distinguished as Conservatives have done ever since, between change for its own sake which he rejected, and change as the result of clear evidence that an existing institution was running badly. Alongside the Tamworth Manifesto went the creation of constituency associations and the change in the name of the party from Tory to Conservative. Gradually, election by election, the new party under Peel's leadership gathered round it, not just the traditional squires and aristocrats, but a whole body of sober men from the rising middle class with a stake in the country who believed in cautious progress. David Cameron faced a similar problem when he took over the Conservative leadership in 2005. The crushing defeat in the 1997 election had been made more humiliating by two further defeats under different leaders. The political pendulum seemed to have stopped swinging. There was evidence that people who broadly supported the Conservative approach to specific problems recoiled in distaste when they learned that these were Conservative attitudes. The immediate task of David Cameron was not to rush into specific policies but to create an audience of sympathetic listeners for his general approach, an audience which would then stay to listen to specific policies as they were produced. Part of this new approach, for both Peel and Cameron, has been the practice of constructive opposition. This is not an easy concept to instil into the minds of supporters smarting from defeat. The instinct of these supporters is to lash out, to attack the government on every possible occasion, and to insist that the duty of an Opposition is to oppose. But this is to assume that the game of Westminster politics is pleasing to the electorate as a whole. Both Peel and Cameron settled for a more strategic approach. They insisted that their parties support the government against its more radical friends when support was justified; they declined to throw the government of the country into ferment or uncertainty just because they had an opportunity to do so. David Cameron helped to save Tony Blair's Education Bill, just as Peel saved the Whig government's finances by insisting that his party reverse a vote to abolish the unpopular Malt Tax. This combination of cautious tactics on particular issues and a bold strategy of building support served Peel well. It enabled him in 1841 to become the first Prime Minister ever to take office as a result of a general election victory. At the end of his career he could boast that he had never proposed a measure to the House of Commons which he had not carried. More widely his record of achievement is unmatched by any other peace time Prime Minister. The foundation of the Metropolitan Police as a model for the whole world is well known. The reform of the Corn Laws launched not just Britain but the whole trading world down the path of free trade and globalisation. Other achievements are not remembered because they are taken for granted, though Peel managed them against stiff opposition at the time. The settling of the United States Canada border, the entry of Catholics into the Westminster Parliament, the establishment of a banking system on a statutory basis founded on gold, the organisation of a modern political party, the transformation of the criminal justice system were each formidable accomplishments. Peel insisted on facts and allowed those facts, for example of poverty in industrial Britain, to shape his actions, even at the risk of fatal damage to his own position. When he died the political elite discovered to their amazement that he had, without seeking it, achieved a formidable popularity among hundreds of thousands of people who had no vote. Factories closed, flags flew at half mast, pennies and sixpences poured in to support memorial appeals. At a time when the thrones of Europe were tottering in 1848 the Chartists gathered in their thousands on Kennington Common to deliver what they hoped would be a decisive blow against the political system which they despised. But that day they were faced down by Peel's police officers and special constables. In the society which Peel had helped to build most people recognised that it was possible and preferable to bring about change in Britain without revolution. Peel would have been wise to conciliate his own supporters more skilfully and to be more sparing in the roughness of his tongue and pen. But fundamental integrity of the kind which Peel showed remains the fundamental requirement for a lasting political reputation. Lord Hurd of Westwell is a former British Northern Ireland Secretary, Home Secretary and Foreign Secretary. 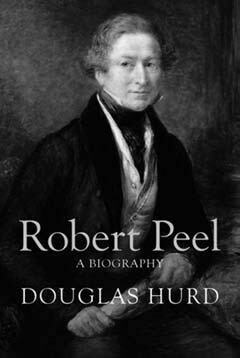 Lord Hurd's Robert Peel: A Biography was published by Weidenfeld in June 2007.